a smart girl’s guide to liking herself offers up practical advice, fun quizzes and tips galore. American Girl is one of the leaders in publishing self-help books and how-to books for the tween girl market. True to the series of American Girl’s Smart Girl series, A Smart Girl’s Guide to Liking Herself is spot on in addressing the issues tween girls face at school, home, with friends and with frenemies. The middle school years can be difficult for just about any tween, but girls in particular can face challenging times while on their journey to high school and beyond. Self-esteem is often a problem girls struggle with as they stare down bullies, frenemies and their own critical self evaluations. Even girls who were optimistic and confident during their younger years may find the middle school years challenging and in the process, may loose sight of who they really are. But Dr. Laurie Zelinger offers hope to all tween girls in her book, A Smart Girl’s Guide to Liking Herself. The book walks girls through numerous everyday challenges, offering up practical advice, tips on making the most of both good and bad days, and a little cheerleading to get the reader just a little pumped up. Zelinger first explains to girls what self-esteem is and how it can impact the way a girl feels about herself and takes on the challenges of the day. She even helps educate the reader explaining where self-esteem comes from and even how to change low self-esteem. She begins the book with a self-esteem quiz, so that girls can figure out how confident they are and if they’re on track to having healthy self-esteem. Later chapters help the reader move forward in their journey, encouraging them to give back as a way to boost self-esteem and encourage self-discovery. Zelinger also gently prods the reader to keep trying for more — to put herself out there by trying out for a play or a sports team or joining a school club. Remaining chapters focus on a variety of topics including how to make friends and beware of frenemies, how to overcome and deal with shyness, how to talk with parents and how to show off your strengths, talents and passions. One of the most helpful sections deals with bad days, and how girls can manage them and move on. Zelinger points out that bad days happen to everyone and sometimes they are just out of your control. But her advice on getting past them gives girls the empowerment to forge ahead and reach for the next goal. Fun quizzes, tests, games and activities help girls evaluate where they stand and what they may need to work on in order to make a strong first impression or reach a particular goal they set for themselves. There’s even a progress tracker in the back of the book that encourages girls to tackle new experiences, such as trying out for a play, running a mile or giving a speech. The book’s whimsical art and graphics makes it a breeze to get through, and easy for girls to chart progress as they go. A Smart Girl’s Guide to Liking Herself is a wonderful guide for any girl who has struggled with self-esteem or just needs a little encouragement during those middle school years. Great ideas in how to deal with situations, understanding myself and to self motivate. Another great book that my girls enjoyed. Every young girl needs this book. My 13 year daughter loves this book! It is so easy to read. She normally does not like to read and she likes it. Wonderful guide for young girls…I think all 8-12 yr olds should read it! We are only part way through…but this book has been very informative for my 9 yr old daughter! She has always been so confident, but certain life changes and growing up has made me worry she would lose her confidence. Just reading it seems to make her self esteem improve. Highly recommend for all young girls! It is a good conversation starter between mother and daughter as well! I have a 10 year old daughter who struggles with being highly emotional. She is a kind hearted girl that always wants to please everyone. This book is so great for her. It has stories and examples about the struggles of being a young girl and how to deal with friendship problems, sibling problems and just everyday pressures of being a kid. There are great examples on how to deal with conflicts at school and how to learn to like yourself regardless of what others think of you. I am trying daily to teach my daughter the art of self love, and sometimes she needs to learn it from other examples. I believe this book helps teach that and I am grateful for the examples and stories and advice. A MUST have for every young girl!!! Love love love love this book to help my girl when she is not so happy with her family. This is a must. Santa brought an entire set and she reads them here and there as she needs some advice she doesn’t want from me. Can’t go wrong with these books. Fantastic for teens and young girls. Bought this for my 8-year-old step-daughter and we both love it. Bought this for my 8-year-old step-daughter and we both love it. Wish this had been around when I was her age! Awesome set 🙂 I recommend these books to help the transition period and to help cover those topics that are possibly overlooked. Great Book!! My daughter isn’t too into reading, but this caught her interest. I was quite surprised. What a great book. Found this book initially at the public library. My daughter liked the book so much that I decided to buy a copy for her to read over and over again and use as a reference. This book has helped her to accept things better and cope with issues she has had. It has helped boost her self-esteem too. I love reading these with my 11 year old daughter. These books addresses great topics for girls this age, and gives my daughter and I the opportunity to discuss things in a helpful way. Everyone struggles with self esteem, even the most confident people. This book help make my 11 year old daughter feel like she was not alone in her feelings. She respects the advice and take it to heart. American Girl books are a great resource for parents struggling with finding the right words to say at the right time. Though I am NOT a fan of AMERICAN GIRL DOLLS (overpriced & out of reach for the average family), the company puts out some FANTASTIC books. This is a MUST-HAVE for EVERY Tween/Teen. I would recom. to everyone that has kids. Wish they had these books 40 yrs. ago… 10 star rating. This is such a great book! I recommend this book for all young girls! Helps the, realize that they are perfect just the way they are! I highly recommend this for young girls! I read it to my 5 year old! Alright, so I grew up with American Girl. I have two dolls that I treasure to this day, and the books helped me through a lot while growing up. I am not ashamed to say that as a twenty-year-old college student, I bought this book for myself! It gives really great information on self-esteem, how to change it, and basically how to improve who you are altogether. Of course some of it is for younger girls (as it was written primarily for younger girls ten and older) but take it from me – if you are a young adult and you might be struggling with being away from home at college and trying to discover yourself, this is a good book to look at. It isn’t a difficult read, the art is cute, and the information is timeless. I especially like page 32, which discusses worrying about the future. I know plenty of young adults who could benefit from reading that page alone. I bought this for my 11yr old daughter who just started jr high. This book is a great jumping off point to begin a dialogue with your child that is transitioning from little girl to tween. It reinforced a lot of what Mom has been telling her about how friends and attitudes change and how to deal with social situations. She really likes it and refers to it often when she has an argument with a friend or feels insecure about something. She feels more comfortable coming to me with questions. Definitely recommended! This book is filled with great information and wonderful ideas to truly help with self-esteem. I am a school psychologist who purchased this book to use with girls in my school counseling groups. The girls love the book and have been able to implement the advice and strategies presented to help them in their lives. They enjoy the quizzes throughout the book which help them to reflect upon who they are and then engage in meaningful conversations about making changes and empowering themselves. I got this book for my daughter to read on days she is feeling a bit down in the dumps. She has enjoyed the messages inside and it has helped her to feel better. Every girl goes through a period in their life where self esteem becomes an issue and where they must overcome this to be the person that they want to be. This book helps any girl with understanding this and knowing that they can move past this and become a stronger, more self-aware person that can stand up to any bad day that may come their way. What was great about this book was how easy it was to read. The book is set up in such away to offer practical advice to anyone reading the book and the tips are ones that you can utilize immediately. I liked some of the quizzes that the book puts you through to make you question what you would do in situations and help you to become more aware about what is most important. 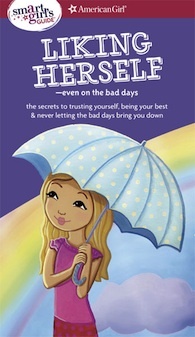 Overall though, the book is a self-empowering book that helps girls know that they can overcome even the truly bad days and come out stronger in the end which is a message that any parent would want for their girls! I wish this book had been available during my daughter’s adolescent years–or mine! Packed with encouragement and thoughtful advice, this engagingly written book’s message is that confidence and self-esteem are active–the result of the things we do and the way we think, not something we’re born with or must depend on others for. This empowering idea is evident on every page, with “quizzes” for helping girls make sense of their feelings, tips for responding to disappointments and challenges, and activities for setting and achieving goals. The book is meant to be accessible at any point, depending on a reader’s needs, and the author’s tone is very supportive, encouraging girls to change the negative messages they hear (especially from themselves) in order to grow toward their potential. You won’t regret getting this book for the young girl in your life, and you might even try out some of its advice yourself.